Saints supporters will have had worse Easter Sundays. First, they got to hear about a defeat for their local rivals, Leicester Tigers, who were beaten by a bit of Danny Cipriani magic as Sale Sharks maintained their unbeaten home record with a 27-20 win. 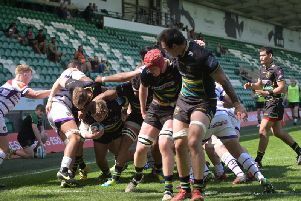 Then, they were treated to stirring fare at Franklin’s Gardens, where Jim Mallinder’s men enjoyed a second-half resurrection, storming back from eight points down to earn a bonus-point win. There was no Easter egg-inspired lethargy late on as excitement levels peaked with a Harry Mallinder score. The son of the boss has been Saints’ saviour a few times this season, including scoring a match-winning try at home to Glasgow Warriors to help his team secure a Champions Cup quarter-final spot. And this was another key moment in an undulating campaign. in fact, this could be the biggest of them all as it pushed Saints clear of Quins and earned that vital extra point that moved them above Leicester in the table. In a game of to-me, to-you that the Chuckle brothers would be proud of, Saints and Tigers are exchanging fourth spot with regularity right now. And you could see Richard Cockerill’s men going back there by beating Gloucester on Saturday ahead of Saints’ trip to Wasps a day later. But what Sale’s win, Saints’ success and Mallinder’s score did was ensure that east midlands derby on April 16 will be gargantuan. Whatever the results next weekend, Saints will know they can keep their destiny in their own hands because of that head-to-head with Tigers. And at various points on Sunday that didn’t seem like it would be the case. When Tigers stormed back to 20-20, it appeared they would do what they usually do: find a way to earn a victory at a vital time. But Sale shut the door and Cipriani stole the win. Then, when Quins scored early in the second half to go eight points up, it looked like Saints might waste their chance to go fourth. But back they came with a rousing riposte, scoring two more tries in a stunning recovery against a Quins side boosted by the presence of their Six Nations stars. It was such a crucial comeback and one that earns some momentum going into Sunday’s tricky trip to Wasps. Dai Young’s men have won nine of their past 10 games, while Saints have won six of their past eight. It promises to be a Ricoh Arean humdinger. And Saints fans can now look forward to it safe in the knowledge that their team are still alive in this exhillarating race for the top four.